Slight change to the planned article. At the end of my analysis in Part 1 I discovered I was missing a number of key messages. 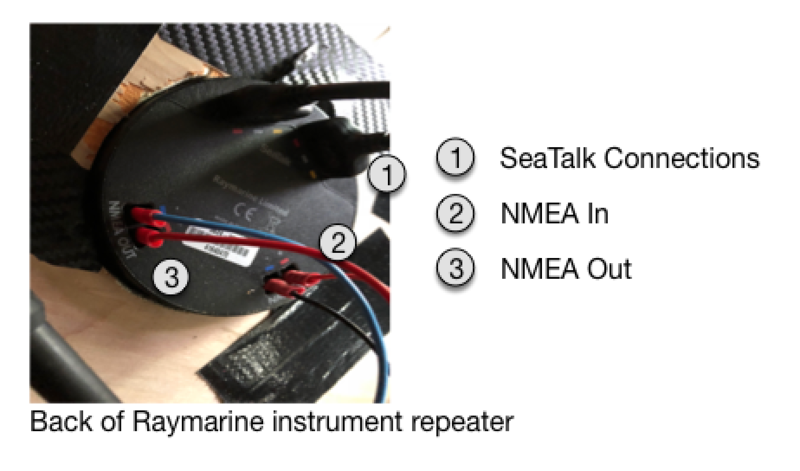 It turns out that not all the SeaTalk messages from the integrated instruments were being translated to an NMEA format and therefore not being sent wirelessly from the AIS hub. I didn't really want to introduce another source of data directly from the instruments as it would involve hard wiring the instruments to the laptop and then translating a different format of a message (SeaTalk). I decided to spend on some hardware (any excuse for new toys). I purchased a SeaTalk to NMEA converter from DigitalYachts (discounted at the London boat show I'm glad to say). This article is about the installation of that hardware and the result (hence Part 1.1), not our usual type of blog. You never know it may be of interest to somebody out there and this is a real-life data issue! Don't worry it will be short and more of an insight into Yacht wiring than anything. The next blog will be very much back on track. Looking at Kafka in the architecture. 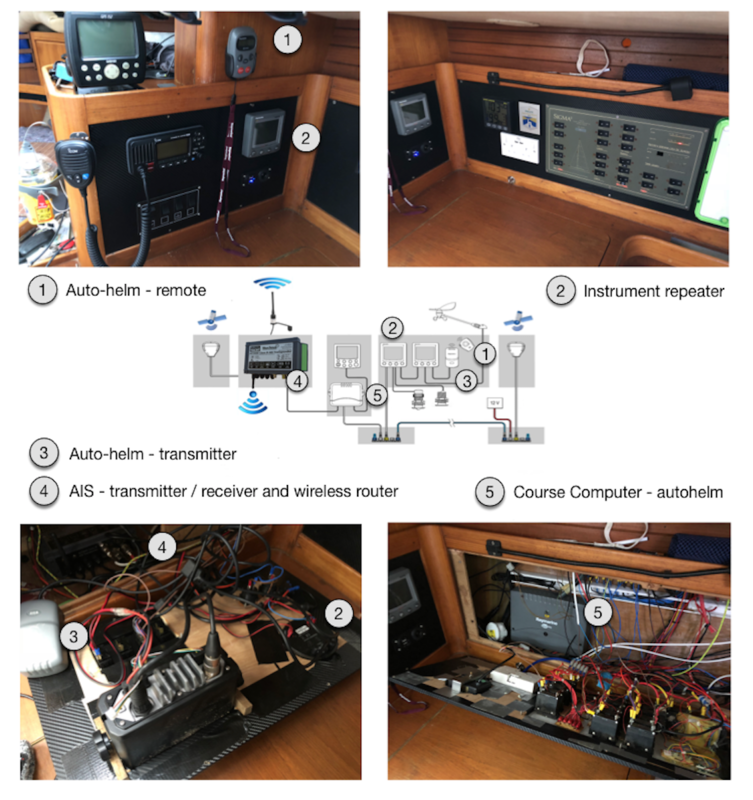 The following image shows the existing setup, what's behind the panels and how it links to the instrument architecture documented in Part 1. No laughing at the wiring spaghetti - I stripped out half a tonne of cable last year so this is an improvement. Most of the technology lives near the chart table and we have access to the navigation lights, cabin lighting, battery sensors and DSC VHF. The top left image also shows a spare GPS (Garmin) and far left an EPIRB. I wanted to make sure I wasn't breaking anything by adding the new hardware so followed the approach we use as software engineers. Check before, during and after any changes enabling us to narrow down the point errors are introduced. To help with this I create a little bit of Python that reads the messages and lets me know the unique message types, the total number of messages and the number of messages in error. #print "ny list is empty"
For each of the steps, I used nc to write the output to a log file and then use the Python to analyse the log. I log about ten minutes of messages each step although I have to confess to shortening the last test as I was getting very cold. While spooling the message I artificially generate some speed data by spinning the wheel of the speedo. The image below shows the speed sensor and where it normally lives (far right image). The water comes in when you take out the sensor as it temporarily leaves a rather large hole in the bottom of the boat, don't be alarmed by the little puddle you can see. I spool and analyse about ten minutes of data without making any changes to the existing setup. The existing setup takes data directly from the back of a Raymarine instrument seen below and gets linked into the AIS hub. 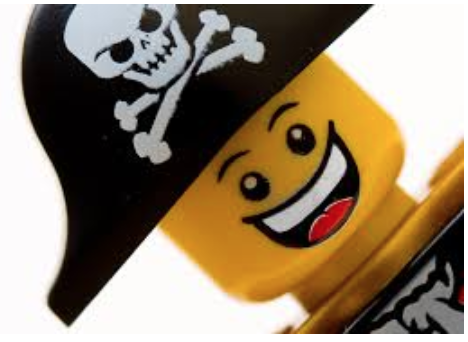 I disconnect the NMEA interface between the AIS hub and the integrated instruments. So in the diagram above I disconnect all four NMEA wires from the back of the instrument. I observe the Navigation display of the integrated instruments no longer displays any GPS information (this is expected as the only GPS messages I have are coming from the AIS hub). I wire in the new hardware both NMEA in and out then directly into the course computer. I get all the messages I am after (for now) the hardware seems to be working. Now to put all the panels back in place! In the next article, I will get back to technology and the use of Kafka in the architecture. Kscope 2018 is just a week away! Magnificent location (Walt Disney World Swan and Dolphin Resort) for one of the best tech conferences of the year! The agenda is impressive (look here) spanning over ten different tracks from the traditional EPM, BI Analytics and Data Visualization, to the newly added Blockchain! Plenty of great content and networking opportunities! I'll be representing Rittman Mead with two talks: one about Visualizing Streams (Wednesday at 10:15 Northern Hemisphere A2, Fifth Level) on how to build a modern analytical platform including Apache Kafka, Confluent's KSQL, Apache Drill and Oracle's Data Visualization (Cloud or Desktop). Do it Before it's Too Late! 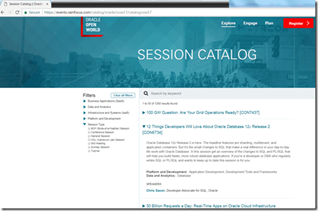 (Monday at 10:45 Northern Hemisphere A1, Fifth Level), I'll be sharing details, based on our experience, on how OBIEE can be fully included in a DevOps framework, what's the cost of "avoiding" DevOps and automation in general and how Rittman Mead's toolkits, partially described here, can be used to accelerate the adoption of DevOps practices in any situation. If you’re at the event and you see me in sessions, around the conference or during my talks, I’d be pleased to speak with you about your projects and answer any questions you might have. And, in the not so distant future, using blockchain to determine liability in case of an accident between two autonomous vehicles by using blockchain to manage timestamped immutable records of decisions made by deep-learning models from both autonomous vehicles right before the accident. Besides these use cases, blockchain has potential to eliminate intermediaries, improve transparency of records, eliminate manual paperwork, and error-prone processes, which together can deliver orders of magnitude improvement in operational efficiency for businesses. Of course, there are other types of insurance such as healthcare, reinsurance, catastrophic events insurance, property and casualty insurance, which would have some unique flavor of use cases but they would similarly benefit from blockchain to reduce risk and improve business efficiency. There is no question that blockchain can, potentially, be a disruptive force in the insurance industry. It would have to overcome legal and regulatory barriers before we see mass adoption of blockchain among the industry participants. If you are working on an interesting project related to the use of Blockchain for insurance industry feel free to get in touch by leaving a comment or contact us through social media or Oracle sales rep. We’d be glad to help you connect with our subject matter experts and with your industry peers who may be working on similar use cases with Oracle. For more information on Oracle Blockchain, please visit Oracle Blockchain home pages here, and here. During his keynote at Modern Customer Experience 2018, Des Cahill, Head CX Evangelist, stated that CX should stand for Continuous Experimentation. He encouraged 4,500 enthusiastic marketers, customer service, sales, and commerce professional us to try new strategies, to take risks, strive to be remarkable, and triumph through sheer determination. CX professionals today face numerous challenges: the relentless rise of customer expectations, the accelerating pace of innovation, evolving regulations like GDPR, increase ROI, plus the constant pressure to raise the bar. Modern Customer Experience not only inspired attendees to become the heroes of their organization, but it armed each with the tools to do so. If you missed Carolyne-Matseshe Crawford, VP of Fan Experience at Fanatics talk about how her company’s culture pervades the entire customer experience, or how Magen Hanrahan VP of Product Marketing at Kraft Heinz is obsessed with data driven marketing tactics, give them a watch. And don’t miss Comcast’s Executive VP, Chief Customer Experience Officer, Charlie Herrin, who wants to build proactive customer experience and dialogue into Comcast’s products themselves with artificial intelligence. The Modern Customer Experience X Room showcased CX innovation, like augmented and virtual reality, artificial intelligence, and the Internet of Things. But it wasn’t all just mock-ups and demos, a Mack Truck, a Yamaha motorcycle, and an Elgin Street Sweeper were on display, showcasing how Oracle customers put innovation to use to create legendary customer experiences. Attendees were able to let off some steam during morning yoga and group runs. They relived the 90s with Weezer during CX Fest, and our Canine Heroes from xxxxx were a highlight of everyone’s day. But don’t just take it from us. Here’s what a few of our attendees had to say about the event. We’re still soaking it all in. You can watch all the highlights from Modern Customer Experience keynotes on YouTube, and peruse the event’s photo slideshow. Don’t forget to share your images on social media, with #ModernCX and sign up for alerts when registration for Modern Customer Experience 2019 opens! Howdy, Pardner. Have you moseyed over to JavaRanch lately? Pull up a stool at the OCJA or OCJP Wall of Fame and tell your tale or peruse the tales of others. Ok - I'm not so great at the cowboy talk, but if you're serious about a Java career and haven't visited JavaRanch, you are missing out! JavaRanch, a self-proclaimed "friendly place for Java greenhorns [beginners]" was created in 1997 by Kathy Sierra, co-author of at least 5 Java guides for Oracle Press. The ranch was taken over in subsequent years by Paul Wheaten who continues to run this space today. 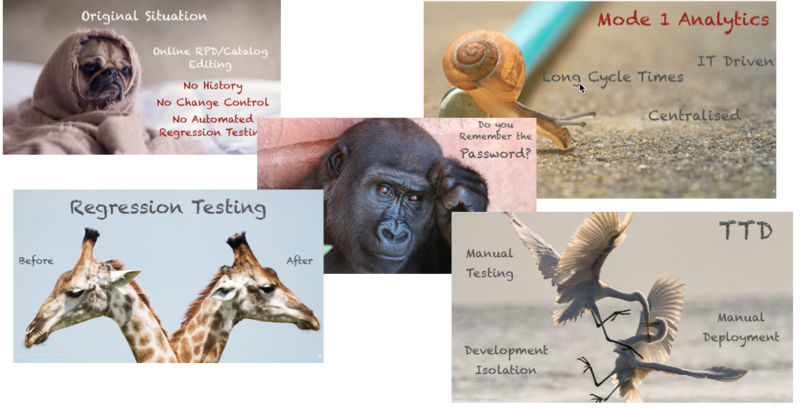 In addition to a robust collection of discussion forums about all things Java, JavaRanch provides resources to learn and practice Java, book recommendations, and resources to create your first Java program and test your Java skills. One of our favorite features of JavaRanch remains the Walls of Fame! This is where you can read the personal experiences of other candidates certified on Java. Learn from their processes and their mistakes. Be inspired by their accomplishments. Share your own experience. 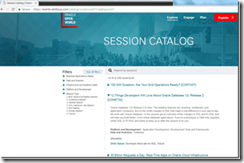 Stay up to date with the Oracle Certification Program. Oracle Mobile Cloud Enterprise 2018 Associate Developer | 1Z0-927: This certification covers implementation topics of related Oracle Paas Services such as: Visual Builder Cloud Service, Java Cloud Service, Developer Cloud Service, Application Container Cloud Service, and Container Native Apps. This certification validates understanding of the Application Development portfolio and capacity to configure the services. Oracle Management Cloud 2018 Associate | 1Z0-930: Passing this exams demonstrates the skills and knowledge to architect and implement Oracle Management Cloud. 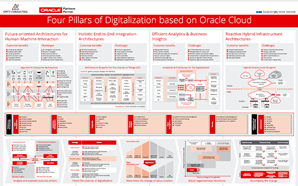 This individual can configure Application Performance Monitoring, Oracle Infrastructure Monitoring, Oracle Log Analytics, Oracle IT Analytics, Oracle Orchestration, Oracle Security Monitoring and Analytics and Oracle Configuration and Compliance. Oracle Cloud Security 2018 Associate | 1Z0-933: Passing this exam validates understanding of Oracle Cloud Security portfolio and capacity to configure the services. This certification covers topics such as: Identity Security Operations Center Framework, Identity Cloud Service, CASB Cloud Service, Security Monitoring and Analytics Cloud Service, Configuration and Compliance Service, and services Architecture and Deployment. 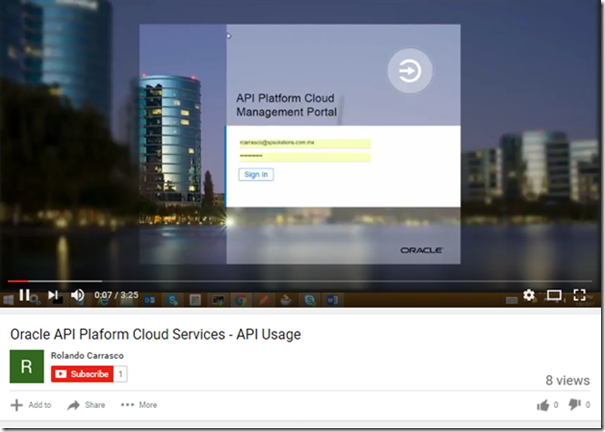 Oracle Data Integration Platform Cloud 2018 Associate | 1Z0-935: Passing this exam validates understanding of Oracle Application Integration to implement the service. This certification covers topics such as: Oracle Cloud Application Integration basics, Application Integration: Oracle Integration Cloud (OIC), Service-Oriented Architecture Cloud Service (SOACS), Integration API Platform Cloud Service, Internet of Things - Cloud Service (IOTCS), and Oracle's Process Cloud Service. Oracle Analytics Cloud 2018 Associate | 1Z0-936: Passing this exam provides knowledge required to perform provisioning, build dimensional modelling and create data visualizations. The certified professional can use Advanced Analytics capabilities, create a machine learning model and configure Oracle Analytics Cloud Essbase. How Does the DBA Keep Their Role Relevant? By having the skills to meet the new demands for business optimization along with a reputation of continuous learning and improvement. Check out how training + certification keeps a DBA relevant. Read full article. Building upon the competencies in the Oracle Database 12c OCA certification, the Oracle Certified Professional (OCP) for Oracle Database 12c includes the advanced knowledge and skills required of top-performing database administrators which includes development and deployment of backup, recovery and Cloud computing strategies. Find out how to upgrade with this exam! Oracle BI Publisher 12.2.1.4 Now Available !! Last week Oracle BI Suite 12.2.1.4.0 has been released and that includes Oracle BI Publisher 12.2.1.4.0. The links to download the installation files, documentation and release notes are available from BI Publisher OTN home page. You can also download the software from Oracle Software Delivery Cloud. The new features introduced in Analytics Cloud Suite for both Data Visualization and BI Publisher are now available for on-prem. You can find the list of new features for Data Visualization here and for BI Publisher here. Upgrading to Oracle Business Intelligence from 12.2.1.x to 12.2.1.4 is an in-place upgrade performed by Upgrade Assistant. 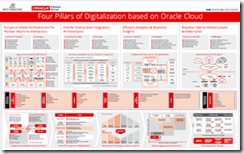 Refer to the upgrade guide for details on upgrade from a previous 12c version. Adding Native Pivot Charts and Tables to your Excel Reports!! A report in Excel format is a very common requirement and BI Publisher can generate excel output using RTF, XSL or Excel Template. Excel template is recommended when the requirement is to create pixel perfect column width, to use built in excel functions, to create multi-sheet output, to handle preceding zeroes in data, to maintain data formatting, to manage high number of columns of data, etc. How about adding native charts and pivot tables in the excel report ? Well, excel templates can handle that too. Load a sample XML data. Add data column header names. Use "Insert Field" option from BI Publisher Ribbon Menu and create data place holders as shown below. You will see an interim dialog box from the Template Builder that a metadata sheet will be created. Click OK on it. Preview the output. This will bring all records in the excel sheet in a separate .xls output file. You can close the output .xls file and stay in the Excel Template. Now select all the data columns to be used in the Pivot Chart and table. You can click on column headers and select the entire column to be included or you can just select the table with column headers and single row of data placeholders. From Excel Menu Insert, select Pivot Chart & Pivot Table option. In the dialog box "Create PivotTable", you can keep selected the option "Select a table or range" and leave the Table/Range that appears by default based on the selection. You can choose to create the Pivot Chart and Pivot Table in a new work sheet (recommended).Click OK. Here you can select the fields for the Pivot table and chart, to be depicted as Axis, Legend and Values. In this example we have included Product Type, Product, LOB and Brand as Axis and Revenue as Values. Please note that by default the function selected under Values is Count. Therefore, select the drop down next to Count function and choose Value Field Settings, where you can change this to Sum function. One more thing to note is the presence of Field Buttons in the chart. You can hide these Field Buttons. With Pivot Chart selected, go to Analyze Menu in the Ribbon style Menu, and under Show/Hide section choose "Hide all Field Buttons". Right click on Pivot Chart, select PivotChart Options, select Data tab. Here select the option "Refresh data when opening the file". This will bring the data dynamically into the PIvot Chart and Pivot Table. You can run preview of the excel output and you will see the pivot table and chart displaying dynamic data. You will notice blank data appearing in the Pivot Table and Chart. This is due to the way the looping works against the dynamic data. You can hide this blank data by filtering the blank data from the parent field in the pivot table of the output excel file. In this example, we will remove the blank data from Product field and the complete blank section will be removed without affecting rest of the data. To do this, just hover over Product in the right side pane under Pivot Chart Fields and click on the down arrow. This will open the filter options for Product field. Uncheck the Blank value from filter list. You can further include excel functions and formula within these pivot table and charts as necessary for your requirement. You can even change the chart type, style etc. to create the most appropriate visual representation of the data. You can upload the excel template on BI Publisher server and run it against live data. You can include as many sheets with different pivot charts and tables, as required for your report. Also note that excel template can be run against any data source type in BI Publisher Data Model. Therefore you can use BI Analysis or even run a BIJDBC SQL query against RPD layer, and bring complex calculations, aggregations as a part of your data. Hope this was helpful. If you want to check the sample template and data, download it from here.